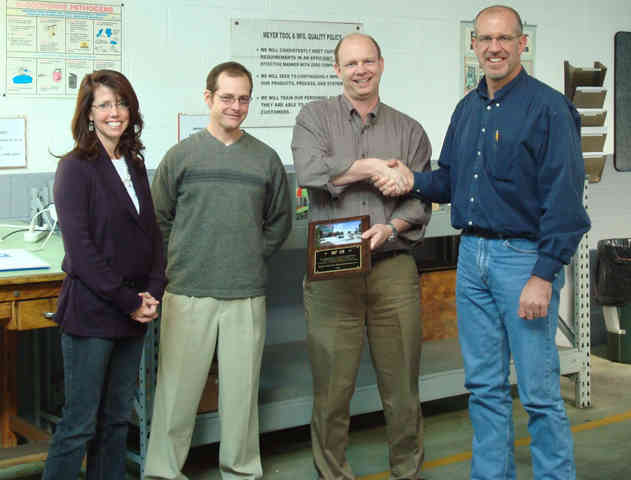 Meyer Tool receives award from Lawrence Livermore Laboratory - Meyer Tool & Mfg. 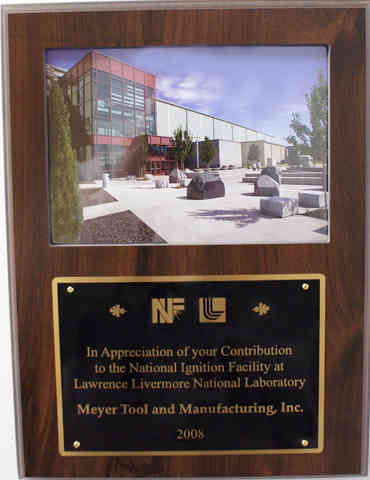 On December 2, 2008, Meyer Tool and Mfg., Inc. was honored by the National Ignition Facility (NIF). Senior Engineers James Davis and Shawn Strickland made a special trip to Meyer Tool to present a plaque inscribed “In Appreciation of your Contribution to the National Ignition Facility at Lawrence Livermore Laboratory”. Mr. Strickland and Mr. Davis were key members of NIF’s team collaborating with Meyer Tool on a $3.4MM dollar contract for 200+ aluminum vacuum vessels completed in August of 2008. ​The National Ignition Facility, to be dedicated on May 29, 2009, is a 192 beam experimental laser facility located in Livermore, California. It will be the world’s largest and highest-energy laser facility, capable of creating pressure and temperatures found only in stars and inside nuclear weapons. NIF has three complementary missions to achieve through its experimental programs: Nuclear Security Stockpile Stewardship, Fusion Energy, and Basic Science in High Energy Density Physics. Left to right: Eileen Cunningham, Meyer Tool; Shawn Strickland, NIF; Ed Bonnema, Meyer Tool; Jim Davis, NIF. Since 1998 Meyer Tool has been a key supplier to NIF with total contracts exceeding $12MM. The majority of the contracts have been for large stainless steel or aluminum vacuum vessels requiring extensive post weld machining to tight tolerances and precision cleanliness levels appropriate for a laser application. A number of contracts have been for production manufacture of families of components including 240 Spatial Filter Beam Tube Modules, 48 Vacuum Isolation Valves and 200 Laser Mirror Housings. 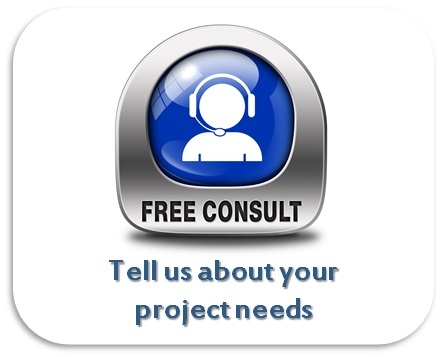 Similar to other work performed by Meyer Tool, NIF contracts require tight project management control to properly maintain schedule, control of government furnished equipment, vacuum tight welding (especially of aluminum), minimization of weld distortion, post weld precision machining of large weldments, vacuum leak testing, pressure testing, adherence to laser system cleaning requirements and clean assembly protocols, adherence to packaging and crating protocols, complete and accurate documentation and records, and most importantly open and honest communication between Meyer Tool and the customer to execute the project in a collaborative manner. While not directly related to work in Cryogenics, Meyer Tool has built a number of 1 meter diameter x ~6 meter long stainless steel vacuum vessels for NIF designed to contain cryogenic instrumentation. These are in many ways similar in size, tolerances and construction to Cryomodules used to contain SCRF cavities. 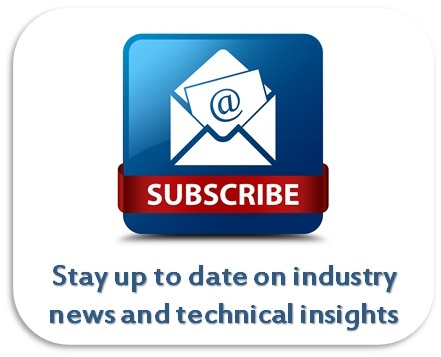 Meyer Tool and NIF hope to continue their relationship with work on the next phase of the project the National Ignition Campaign (NIC).